I trust that you are well on this rather drab day and enjoyed a few recollections of our Shakespearean paranormal activities in yesterday’s post. Today though, pretty much hot off the (virtual) presses, I am delighted to reveal the first of the promotional materials for our upcoming ‘All the Great Books (abridged)’. I am certain many of you will be familiar with the inspiration behind it and am sure you will also notice the new logo for our ‘Matchbox Sized Shakespeare Company’. Formed last year for our ‘Compleat Works’, this group has become something of a spin off project focussed upon very distinct sorts of theatrical experience, which we hope will continue to evolve, grow and appear in various guises over forthcoming years. What that experience actually entails, well if you saw last December’s work then I am sure you will have a very good idea. If not then keep checking in over the next month, there will be more details, a trailer and pictures coming in the very near future; and then buy yourself some tickets, the box office will be opening soon! And on that note as 12:00 draws near (midday- not quite the Witching Hour I know), I will leave you to whatever supernatural, spooky or, if you are like me and just think of the day as October 31st, non-All Hallows Eve based adventures you have ahead of you and will report back tomorrow. Drawing on Matchbox members young and old, with faces familiar and new -this was Rosanna Grimes’ and James Mercer’s debut if I recall correctly – it proved a play both breath-taking in its spectacle and compelling in its mixture of the comic and the dramatic with a blend of ghastly intrigue and treachery and more than a fistful of belly laughs provided by the marvellous double act of Gill and Jerry Moore as Stephano and Trinculo cheating my Caliban. That was a role I truly relished playing and, trite or cliché as it sounds, I certainly felt something magical in the air in the twilight whilst I delivered the ‘Be not afeard..’ speech. Then again, that is probably the filters of dewy eyes nostalgia working overtime again, but isn’t that part of its magic? Of course any reflection on this marvellous play must pay tribute to Tim’s incredible rendering of Prospero, a genuinely winning portrayal- engaging, cruel, commanding and compelling; a true triumph and tour de force of acting. I am sure he wonders what happened as he now spends his rehearsals reciting desperately, hopping nautically, flying heroically, staring fixedly and riding stick horses fanatically. But that is a story of things yet to come. Thus I will leave you with the memories of a balmy summer and a wonderful weekend of theatre from the past. Stay tuned, as I will be publishing exclusive a sneak preview of ‘All the Great Books (abridged)’ promo poster as well as further information on the forthcoming ‘Accrington Pals’ auditions in the next couple of days Until then, take care. And as always, if you have any memories or thoughts about this production, or any that we have done, feel free to contribute. Firstly, welcome to those of you who have signed up to follow the Matchblog in the wake of our recruitment evening and I hope that what you have seen from our previous works will encourage you to get involved in some of our future projects. Our current project is certainly now beginning to take shape as the jigsaw of ‘All the Great Books (abridged)’ begins to slowly piece together. It has certainly been a blessing with my continued long and slow convalescence to be able to get out, sit, elevate the leg and work with The Matchbox Sized Shakespeare Company once again; and, after a fun and very funny rehearsal yesterday, cliché as it is, I can assure you that ‘laughter is the best medicine’. More news from that front in the very near future, of course, alongside a taster or two from rehearsals in the next couple of weeks. I will also be publishing links to audition speeches for ‘The Accrington Pals’ in the next few days and hope, as I said at the outset, to see a few of you there on the 10th. However from one regiment in a future production to another from the past, as my delve into the archive takes us back to March 2009 and our anthology evening of “‘A Merry Regiment of Women’ and Other Plays.” This project was born out of The Curse of ‘The Crucible’ but this proved to be a fortuitous piece of happenstance which led to a very different sort of evening at St. Francis Church Hall. Following the lead actor pulling out of the, then scheduled, Arthur Miller play about the Salem Witch Trials, and with successive searches proving futile, things had come to something of a crisis. A play needed to go on but it was not going to be ‘The Crucible’ Thus in a momentous summit meeting at Normanhurst it was decided that Pat Williams and Mike Downing would share the workload in the time provided and produce an evening of short plays and vignettes which would all be loosely linked, the climax of this being Rae Shirley’s irreverent, ironic and iambic ‘Merry Regiment’ This play had as its central conceit a gathering of Shakespeare’s most famed women, Lady Macbeth, Cleopatra, Kate, Desdemona, Juliet and her Nurse discussing the availability and quality of roles in the Bard’s plays, interrupted at various points by three of Shakespeare’s men, each offering their own perspective. Fast paced, fun and flighty it was a rare occasion for me to watch a play that I had seen nothing of previously, not even stumbling into rehearsals, and was a wonderful conclusion to an evening of fun theatre which had been preceded by a series of delightful sketches and with George Bernard Shaw’s ‘The Inca of Perusalem’. Termed a comedietta, this latter piece was not one I was familiar with and was, as I recall, of a slightly absurd bent but fast paced and humorous, allowing many of our talented comedy performers opportunity to show off their timing and wit. As for the pithy vignettes, sandwiched in between the larger works, these showcased our very own Dot Pullan alongside Zoe Teverson, a former regular of the Matchbox, but I have to admit the titles seem to have eluded my memory at the moment. I would be extremely grateful if anyone would furnish me with that information in the comments section below. In all, another marvellous night and one to happily revisit with a nostalgic glance of a photo or three. Thus I will leave you with that, wish you a splendid week, and, as I said at the outset, I’ll be back here in a few days with some updates about forthcoming events. As promised on the recruitment evening and in previous posts, here is audition information for our March production next year, ‘The Accrington Pals’. Scheduled for 20th-22nd, this play by Peter Whelan is a poignant piece set in the early years of the First World War, as the country’s jingoistic optimism starts to wane and the true terror of warfare gradually becomes clear. At a time when the country will be commemorating the centenary of the start of the Great War, it seems appropriate for us to tackle this powerful piece which looks at both the terrifying experiences of the men at the front and the women who were left behind- mothers, wives, daughters, lovers – and its exploration of how nothing would ever be the same again. An epic and deeply humane play, it dramatises the lives of ordinary people caught up in historical events. Funny, intimate and moving, ‘The Accrington Pal’s charts the fortunes of a close-knit community on the brink of change. Owing to the distinct regional nature of the play the ideal would be for all characters, besides Rivers, to speak with a Lancashire accent but further decisions about that will be made nearer the time. If you have any questions then please either drop me a line here or email me directly at savbloke@hotmail.com. There will of course be a need of a technical and backstage team and I will provide further details of that in a future correspondence. As I said in yesterday’s post, my next dip into the archive has seen me reminiscing over the December 2009 production, Richard Crane’s ‘Under the Stars’. After the successful but troubled production of ‘The Crucible’ that dominated a significant part of that year and didn’t actually go up until mid-September – more of which in a future blog- time was a huge factor in getting this play together. This was no mean feat for the director Pat Williams, but even more of a challenge for its two central performers, Gill Challenger and K Isom. Playing two understudies, Regina and Stella, seemingly at polar opposites of the spectrum in terms of approach to their craft, the weight of line learning was tremendous, with both actors being on stage for the lion’s share of the piece and having numerous scenes together with dangerous similarities in style and substance. Ably supported by John Mackintosh , James Mercer and Dot Pullan with a small team of disembodied voices backstage supplied by myself, Annie Norris and Vicky Pearce, this was another very successful run. Although comedic in many parts there were a number of poignant moments that were adeptly wrung out of the script by two performers who were very much at the top of their game and who worked magnificently together. It is no wonder that they have continued to be the ‘go to girls’ of The Matchbox in the intervening years. Indeed, I have made no secret that, at some directorial juncture in the future, I would like to find a piece that would again tap into the DNA of this experience and place K and Gill together in another play that would give them chance to show off such talents. There were certainly some shades of that alchemy in the last play, let’s hope an opportunity comes along for them to fully revisit it in the near future. I hope you enjoy this collection of shots whether you were involved or not, it certainly brought a few good memories back for me. And with that said, keep an eye out on your inbox, as promised, there will be some important information regarding our next production in the next 48 hours. Well, wasn’t that a good night. I think it is universally agreed that our recruitment gathering on Sunday was a success. Successful in the number of people who came along from a variety of age groups, some of whom are now I hope reading these words; successful in its bonhomie and convivial atmosphere which is always welcome on a Sunday evening; successful in the interest shown by so many of our guests and successful as a celebration of what we do so well, with a marvellous retrospective of posters and photos going right back to the first ever Matchbox production ‘The Happiest Days of Your Life’ way back in 1981. 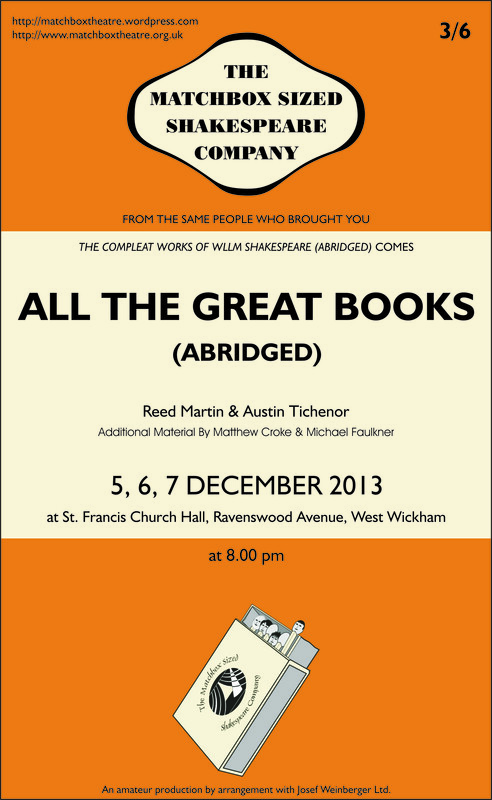 It was also nice to showcase a taster of our latest work, the forthcoming ‘All the Great Books (abridged)’. And though it was all rather spontaneous and thus far we have only looked at it twice in rehearsal, it was encouraging to see and hear the warm response that it received. There is a lot of work that we need to do, we only finished blocking the play yesterday, but I think it is fair to say that we are all optimistic that it is going to be a real treat and a great way to get into December. So, thanks to all who helped out and, more importantly, thanks to you who came along and who are keen to help out. As said on the night, audition notices will be going out in the next few days for our March production of ‘The Accrington Pals’ as well as requests for help in all aspects of what is set to be an ambitious production for March of 2014. Tomorrow I will be dipping into the archives and spending some time ‘Under the Stars’, certainly a boredom buster while I try to keep this leg elevated, and hope to join you there at some point soon. In the meantime have a great day and/or night, take care and catch you soon. The Cook, The Reeve, The Wife and Some Others. Do excuse the delay in getting this post to the blog, it has been a rather difficult fortnight, details of which many of you know and it is not necessary to get into them here. Suffice to say despite some tough days I have been well looked after and am able to get (bandaged) fingers back to keyboard. My current need for convalescence has meant that rehearsals for ‘All the Great Books’ were slightly affected but we got back in business on Monday and continue to get the groundwork down; we will be building on that over the next two months. It was certainly a welcome relief to me to be back in the saddle but more of that anon. More imminently, of course, is our forthcoming recruitment evening on Sunday. I sincerely hope that some of you reading this have been brought here from our advertising and it would be great if you would follow the blog to keep up to date with events to come as well as share in some of the nostalgia from productions past. Details are in the previous post but it promises to be an enjoyable evening whether your interest be acting, lighting, sound, set design, costumes or refreshments. I certainly look forward to seeing a few of you there. A little bit behind with the retrospectives, today’s dip into the archive takes us back to the Christmas of 2008 and the second play I had the pleasure of directing, Phil Woods and Michael Bogdanov’s modern reworking of ‘The Canterbury Tales’. in many ways this was a forerunner to last year’s ‘Complete Works of Shakespeare (Abridged)’ in so much as it was a series of vignettes and sketches connected by a running theme, this being the West Wickham Inaugural Chaucer Storytelling Competition. A carefully orchestrated piece with a smattering of audience interaction, the evening presented eight of Chaucer’s best loved tales in a variety of different formats. With music, dancing, combat, cross dressing and comedy it was a great three day run and each night had a different winner as voted for by the audience and arbitrated by Gill, our Host. With over 40 roles played by a cast of 22 it is amazing to think this was now nearly five years ago but it brings back such fantastic memories of a happy time with a magnificent cast and that, really, is what one really aspires to in this game. Here’s hoping that Sunday’s event will lay the foundations to put on another large casted epic in the very near future. And with that I will say cheerio and get this leg up but will be back next week with the lowdown from the weekend and another series of photos to bring back warm memories of the great things we do.